There are several reasons of mole on face. It directly relates with luck. Mole on cheek strengthens the attraction. They are rich. People who has mole on nose, they are disciplined. Mole on nose denotes struggle in life. If one has mole on under the nose then he has many fans but they meet very few people. Mole on forehead denotes that one does hard work and then get success. Mole on lips denotes that they are very loving. They fall in love every day. Mole on middle of the palm denotes prosperity. However, if the mole is on mountain or on a finger then it is the sign of unfortunate. A person stays away from home if he has mole on his soles. He also gets big success. Mole on chest denotes problem in domestic life. Mole on stomach gives money to the person but it also creates health problem. Red mole denotes prosperity and unfortunate. Red mole on face denotes unfortunate in marital and social and life. If red mole is on arms then it gives economic strength. Red mole on chest denotes person will go abroad and earn lot of money. If red mole is on back then person gets success in army. Mark and stains on face denotes present situation and ups-downs of the person. One gets mark on face when his mind remains turbulent. However, face becomes clean and shiny when mind becomes calm and better. If the cut marks are clear then person has to face many ups-downs. 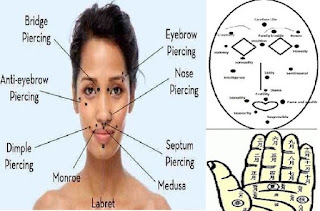 If Rahu-Ketu are strong then person get cuts on face or stomach. Dimple denotes person’s mind. It directly relates with one’s mind. It shows person has very strong personality. He has many fans. He gets too much prestige in society. However, they do not get happiness in marital life. Dimple on one chick denotes person would be emotional and romantic. But dimple on both chicks denotes person would be diligent and clever. Dimple impacts more if it is deep. If man has more hair on face then he does mercy. If woman has hair on face then she is clever and selfish. If man has less hair on face then he is cruel and ambitious. Remedy: Always keep your worship place clean. You will get financial benefit.